Leo loves grand gestures, and Sagittarius loves continuous expansion. These two will urge each other on to bigger and better things in this flamboyant relationship. The only downside may be their tendency to overdo it. Sun in Leo is referred to as The King for a reason: he’s focused on attention, glamour, and being number one. Life is lived with a grandiose flair, and that includes expressing his love for his partner. 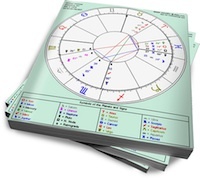 Expensive gifts and dramatic statements are his style, and everything must be “the best.” Sun in Leo is a generous partner, but he is also a demanding one. He expects to receive at least as much (if not more) attention from his lover as he gives. Praise will make him glow and keep him feeling vital, but criticism or indifference will push him out the door. Moon in Sagittarius needs to keep her horizons open. This freedom-loving Moon is perfectly capable of commitment, as long as her partner gives her room to grow. She expresses her feelings with full-on enthusiasm, so her partner must be OK with uninhibited bursts of emotion. Moon in Sagittarius is basically optimistic, as long as she feels there’s something to look forward to over the horizon. This doesn’t mean that her relationship has to be a non-stop adventure, but it’s helpful if she always has a cause or project to engage her emotions. Sun in Leo will be charmed by Sagittarius’ openness (she has no secrets), and Moon in Sagittarius will feel that she’s found a partner for her adventures. Sag will push Leo to express himself with even more pomp, while Leo will keep things interesting for Sag. Whether they travel the world or build a lavish nest, these two will dream big, spend big and do everything on as large a scale as possible. Leo will love the way others look at them, while Sag will just be happy if they always have something new on the go. But in order to keep this relationship from flying off the rails or sliding into debt, some grounding Earth contacts in one or both charts would be helpful. As a Sagittarian, I have had two serious relationships with Leos, so it was interesting to read the above regarding this combination. They both were memorable relationships with good memories.